Civil society has burgeoned since a public uprising ended the Syrian occupation of Lebanon in 2005, with over 8,000 CSOs reported to exist, working on issues including conflict resolution and human rights as well as service delivery. Article 13 of the Constitution establishes the freedom of association. CSOs of most kinds do not need permission to form; they must merely notify the state of their formation. Grounds for the rejection of notification include jeopardising the monarchy and challenging the government. Article 13 of the Constitution establishes the freedom of association. CSOs of most kinds do not need permission to form; they must merely notify the state of their formation. Grounds for the rejection of notification include jeopardising the monarchy and challenging the government. Foreign associations require permission to establish themselves and to vary their operations, trade unions also need prior permission and are subject to strict oversight, and the illegality of LGBTI relations hinders LGBTI CSOs from organising. Refugees from Palestine, who are present in large numbers, are not allowed to form CSOs. CSOs must submit annual reports to the state, although in practice these are little scrutinised, making the exercise a formality, and otherwise, at present, there is little state interference. There are allegations of clientelism and corruption in the state’s distribution of resources to CSOs. The freedom of assembly is guaranteed in Article 13 of the Constitution, and the law requires notification two days in advance rather than prior permission to hold a peaceful assembly. The freedom of assembly is guaranteed in Article 13 of the Constitution, and the law requires notification two days in advance rather than prior permission to hold a peaceful assembly. Assembly organisers are held responsible for any violations, including for speeches that contravene freedom of expression restrictions. The authorities may prevent assemblies if they obstruct public roads or are deemed likely to disturb public morality and security, and there are also instances of excessive force being used against assemblies by security forces. 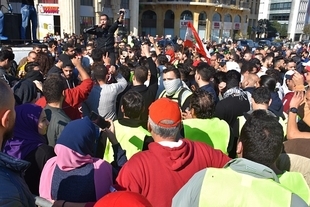 Mass protests, under the "You Stink" banner, sparked in 2015 by the failure to collect rubbish and quickly encompassed broader issues of corruption and government failure, involving over 100,000 people. These were significant protests because they crossed sectarian and partisan lines. The protests attracted security force violence and a number of protesters were referred to military courts on charges of rioting, violence and destruction of property, indicative of a broader trend towards the use of military courts. There have also been street protests calling for progress on electoral reform in 2016 and 2017, as part of the ‘We Want Accountability’ movement. The Constitution’s Article 13 upholds the freedom of expression, and citizens are broadly free to express their views and criticise politicians and public institutions. However, the Penal Code criminalises defamation of the president, the army and other public officials, with recent instances of convictions. The Constitution’s Article 13 upholds the freedom of expression, and citizens are broadly free to express their views and criticise politicians and public institutions. However, the Penal Code criminalises defamation of the president, the army and other public officials, with recent instances of convictions. The Press Law prohibits the publication of news that goes against public ethics, national unity and religious feelings, without clearly defining these. Other laws also contain broad and vague terminology. As a consequence, the Court of Publications has imposed jail sentences and heavy fines on journalists who have reported on issues such as judicial corruption and arms trafficking. CSOs are involved in trying to bring forward a new Press Law. Political polarisation has affected the freedom of expression, as many media are partisan, which can encourage self-censorship and also makes it hard for civil society to gain visibility, although print media have more independence. There are also attacks on journalists by non-state actors, notably on a TV station in 2017. The state does not restrict internet access, and this is growing, but a number of people have been interrogated over social media posts. After considerable civil society advocacy, a right of access to information law was passed in 2017.